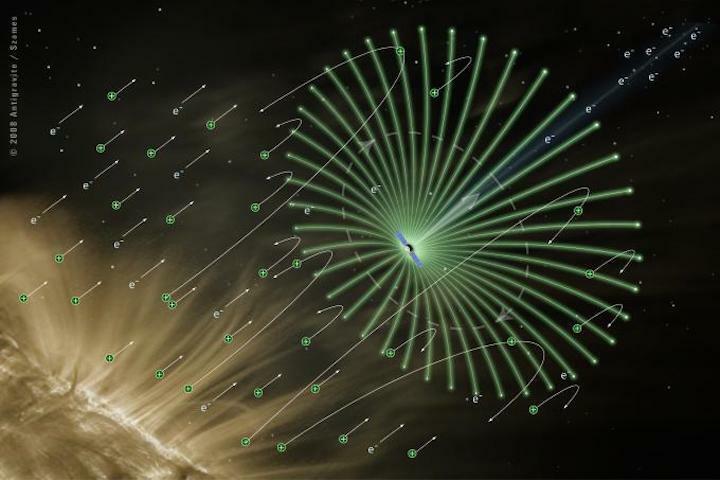 The electric solar wind sail (http://electric-sailing.fi/) is a novel method of propulsion within the Solar system using the flow of electrically charged particles emanating from the Sun, or the solar wind. The system was invented in Finland by Pekka Janhunen and ESTCube-1 is its first orbital proof-of-concept test. The technology is based on the electrostatic interaction between the electric field generated by the satellite and the high-speed particles being ejected from the Sun. The spacecraft utilizing this method would first deploy a set of electrically charged wires, which allow to generate an electric field over a large area. This area effectively forms a "sail" that can be pushed by the charged particles by being diverted by it and therefore transferring momentum to the craft. A 1000 kg satellite would contain a 100 kg electric sail module that could deploy 100 tethers, each with the length of 20 km. Overall this would result in a net thrust of 1 N. This force might seem small, but this can be applied to the satellite over its entire lifetime using only the energy generated by satellite's solar arrays. During one year this could increase the velocity of the craft by 30 km/s. The technology would make it possible to travel in the Solar system cheaply and fast, allowing asteroid mining, landing missions to Mercury and transferring data by "data clippers".